Man, does any one else feel like if they worked 24 hours a day until school started that they STILL might not have their "to-do" lists completed? All in all, I feel like I had a productive day, but there's still soooo much to do! I did start my day off with a smile. 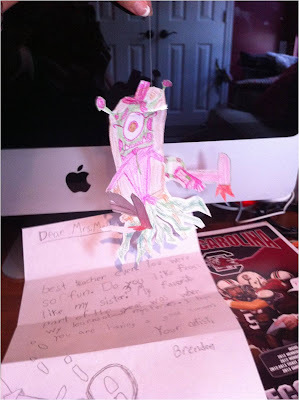 I got another letter from one of my students in the mail and it came with a handmade monster to hang in my new-themed classroom (see the string with the loop he included?). Be still my heart! See how he signed it "Your artist," ....yep, he helped me draw everything - especially sharks and dinosaurs! It also makes my heart smile that he's still talking about our mysteries genre unit which was our very first genre study of the year last year! It was a pretty rainy/wet day around here so I plugged away at my computer all day. 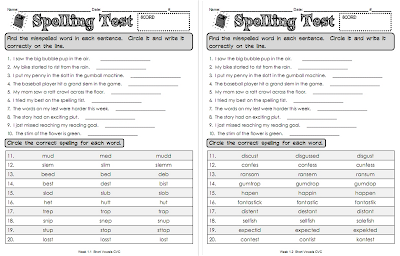 I finished up creating my new spelling tests for the year (that I started like a MONTH ago). I really wanted to find an EASY way to differentiate my spelling. I know many of you have multiple lists going on and even have a SYSTEM in place to call out multiple lists for spelling tests. That's just never worked for me. I always feel like I have to give the ones not taking the test I'm calling out "busy work" to keep them occupied and it makes the spelling test routine take FOREVER. Well, I'm hoping my new system is going to work. It'll take changing up the way I do my test (and I LOVED how I did my spelling tests) but I think it'll work for me. I can't share or sell my tests since the lists I used are not my own, but I'll show you one in case the format/system could help someone else. You can click to see it a little better, but the 10 sentences at the top of both tests are identical. Students will read the sentence and locate the word that is misspelled (circle it and write it correctly). The misspelled word will be a word from the words practiced in class, but not on the weekly lists. This will help to ensure that students aren't just memorizing the words, but actually learning the patterns. 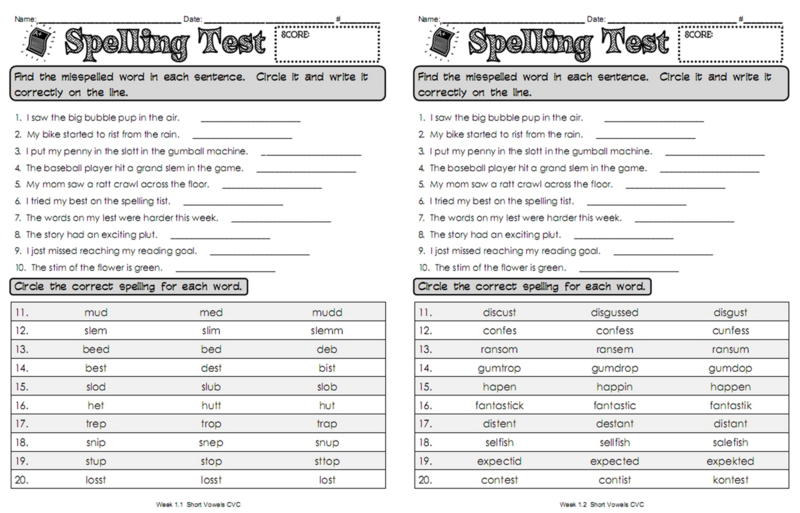 The bottom section of the test is different (word list A test on left, word list B test on right). After I've read the sentences at the top to all students, they will complete the bottom section independently since it's differentiated. They will read the three choices for each word and circle the one that is spelled correctly (great practice for those standardized tests!) I may call out our five weekly word wall words and have students spell those on the back. That will make for 3 different types of spelling assessment, allow for a bit of differentiation, and keep the spelling test routine pretty quick and easy. We'll see how it works! 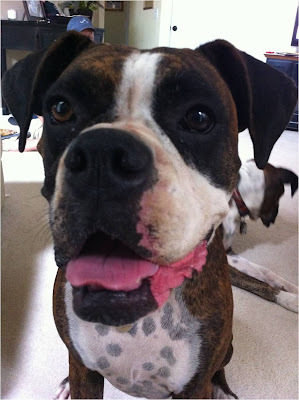 I did take a bit of a break from working today to play with the pups a bit. 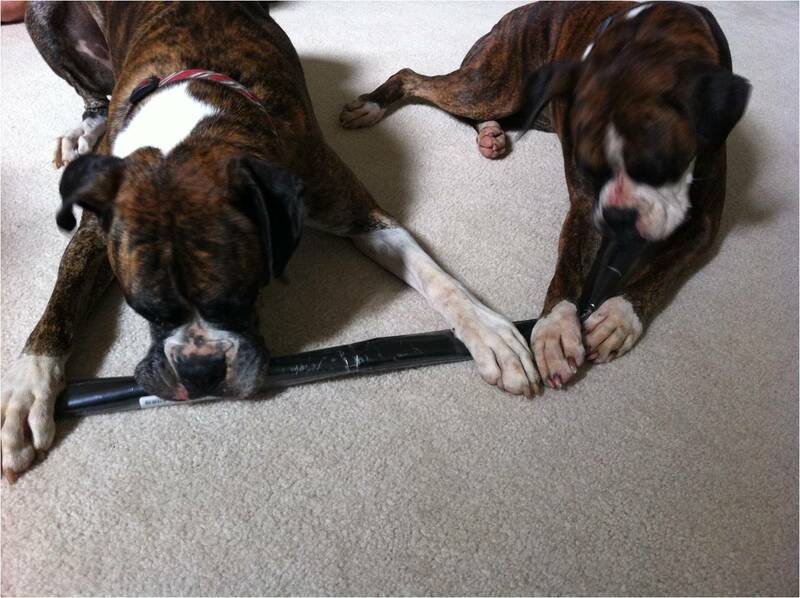 They were very restless this morning since they couldn't go outside. And, who could say no to this face? So, what did we do to get some energy out on this rainy day? We played with a new roll of wrapping paper (it was for a project that went in a different direction). Let's just say it was about an hour of entertainment and FUN! Who knew wrapping paper could be so fun? I LOVE these pups! Then, I got my newsletter for the year designed just the way I wanted it. 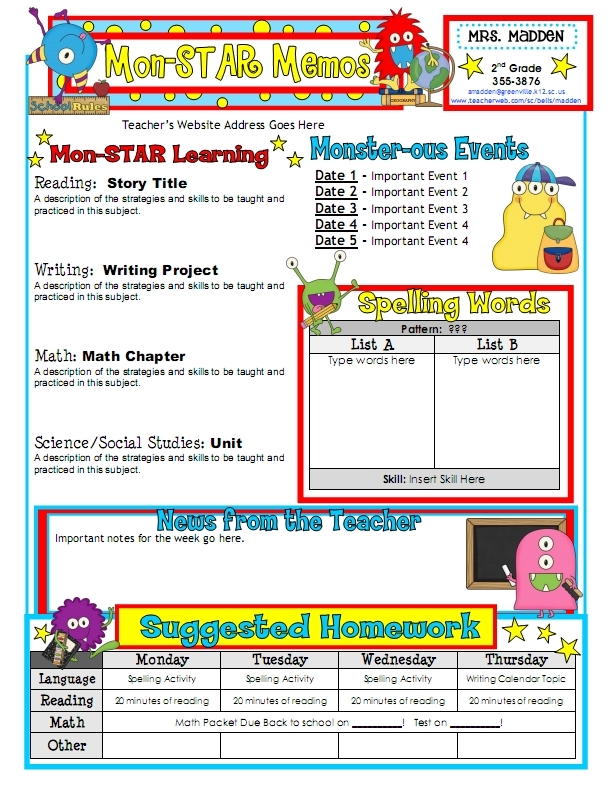 Still need a newsletter template to match your classroom theme? We have them for almost every theme at Teacher's Clubhouse. They come with a Microsoft Word version so you can edit them weekly. If you don't have a theme, there are monthly themed templates available too! 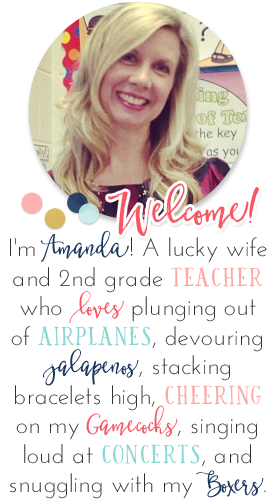 Tomorrow, I'm determined to work in my classroom ALL DAY LONG to get it finished up, but be sure to drop by my blog because I'm kicking off my Budding Blogger series with a special guest tomorrow! Love the newsletter! I feel ya on the 24 hours a day of working! If I am not at school, I am at home on the computer! Differentiation is hard to implement, but I like your strategy. I love the puppy pics. I absolutely LOVE your spelling tests! Is it possible to get the template without the list? It looks so cool. I also really like your newsletter. Your students and parents are so lucky you are so talented! I really like those spelling tests...what a great way to tackle all skills and differentiate! How sweet that one of your previous students wrote you a letter and included a little monster...so sweet! Your newsletter looks fabulous! 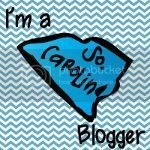 Do you print them in color for every student? We never have a printer with color ink or a copier that would do it! What a great way to teach spelling! I also believe in teaching patterns, but I never had the idea to test in the way you described. I do have students practice writing a word with different spelling patterns and then I ask them to use their "expert eye" to decide which spelling is the most correct. This year I'm using Hope King's Second Grade Word Work. I'm really excited about her program, because like you, she is focusing on spelling patterns. Your newsletter is so cute as well. It's eye appealing and laid out nicely. I will have to find a program to let me upload Word docs to share the template. I'll look into that when I get home this evening, so check back! Precious newsletter. Another thought for differentiated spelling (I used Words Their Way - LOVE IT) is to incorporate the word introductions/testing during Daily 5. It sounds crazy, but it was just crazy enough to work for me. And it worked well! Looking forward to hearing how yours goes throughout the year! How sweet to get a monster from your former student...:) I love your newsletter....and it reminded me that I need to work on mine! I LOVE your spelling routine. How has it been working for you?? 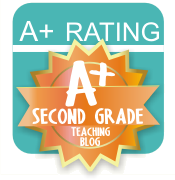 I am hoping that you will be able to share the template for your spelling test with us. Is it on your TPT store? 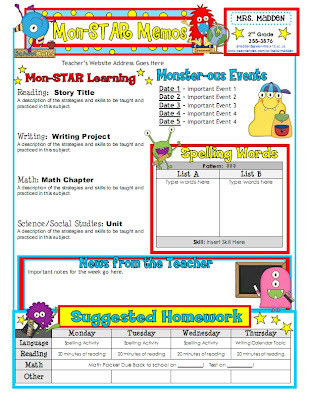 I love this monster memo~ how can I get it?